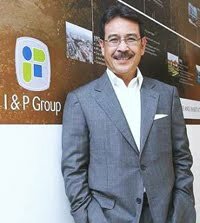 PROPERTY developer I&P Group Sdn Bhd expects to fully develop its massive land bank of about 5,400 acres with a potential gross development value of up to RM10bil over a span of 10-20 years, says group managing director Datuk Jamaludin Osman. “Each of our township will take about 12 years to be fully developed. Our focus will be on the launch of new projects or phases to cater to market demand,” he tells StarBizWeek. The group’s prominent townships include Bandar Kinrara, Alam Impian in Shah Alam, Alam Sari in Bangi and Taman Pelangi in Johor Baru. Jamaludin expects the outlook of the property market to be bright for the year and as such, is confident its launches will be well received by the market. “The target revenue of RM1bil (for the current financial year) may be higher if market demand stays robust this year, hence more new launches are expected at our existing townships,” he says. The new launches include terrace houses, semi-ds and also bungalows. The company is also planning to build service apartments on its existing townships in Klang Valley in future but this will be timed according to market demand. During the group’s launch of Temasya Glenmarie, buyers flocked the launch venue to buy up the property while in Bandar Kinrara, I&P had to resort to a balloting system as the response was overwhelming. “We believe our track record of delivering quality products to buyers and our strategic township locations are the pull factors,” Jamaludin says. The price range of I&P properties are generally not cheap but are still sought after given their strategic locations and expectation of better returns on investment. For example, the recent launch of Sapphire terraced homes in Bandar Kinrara, which had four designs with built-ups of 2,354 to 2,900 sq ft are priced from RM520,888 onwards. Yet, the 104 units had to be sold via a balloting exercise because 448 registrations were received. “Our products do give better returns on investment to buyers. For example, a terrace house in Bandar Kinrara is now worth about RM700,000 while in Alam Impian, a terrace house can fetch about RM500,000,” Jamaludin says. He says the group has three target markets – first time buyers, up-graders and investors. Asked whether the group has any plans to venture abroad like many of its peers, Jamaludin says not for the time being. “We need to do a very comprehensive risk management analysis before making any plans to go overseas. We need to know the risk and also the market situation of the target countries if we go abroad,” he says. I&P Group is a subsidiary of Permodalan Nasional Bhd. It was formed in May 2009 after the successful merger exercise between three companies: Island & Peninsular Sdn Bhd, Petaling Garden Sdn Bhd and Pelangi Sdn Bhd. The exercise also saw several subsidiaries becoming part of the I&P Group, namely Perumahan Kinrara Bhd, Syarikat Perumahan Pegawai Kerajaan Sdn Bhd and I&P Alam Impian Sdn Bhd. View of the living room at Gilstead Two. SELANGOR Dredging Bhd’s (SDB) property arm, SDB Properties Sdn Bhd is riding high in Singapore, eyeing the premium property market there. After the launch of its first residential project in 2007 called Jia, a 22-unit seven-storey apartment block, SDB is moving forward with its second property development, Gilstead Two at Gilstead Road near Newton MRT station. The project, with a gross development value (GDV) of S$200mil (RM470.95mil), comprises 110 units in a 34-storey tower. Unlike Jia, which offers larger unit sizes (two and three-bedroom units of between 1,200 sq ft to 1,600 sq ft), Gilstead Two offers much smaller units (Type A is 904 sq ft while Type B is 775 sq ft). It is believed that Gilstead Two has received positive response; 33 of the 40 units released for private viewing recently were snapped up at prices ranging from S$1,900 per sq ft to S$2,300 per sq ft. The project is expected to be completed by 2014. SDB managing director Teh Lip Kim tells StarBizWeek that the property market in Singapore is buoyant, like other financial hubs throughout the globe. “Property prices there went down in 2008 by as much as 30% in certain areas but has picked up again to pre-crisis levels since the start of the second quarter of 2010,” she says. SDB also has a parcel of land in Singapore, located in Ballestier Road that it plans to develop and launch by the end of the financial year (March 31, 2011). “We are currently coming up with the concept for this development,” she says. SDB has picked Singapore as a sweet spot for its developments due to several reasons. “It is close by, so it’s easy to keep track on the progress of the developments. Singapore is the financial hub of this region and the market is open and competitive. It is relatively easy to do business there, approvals are easily obtained once all the conditions are met,” says Teh. In fact, she says submissions for approvals are made on-line and approvals are also obtained on-line, making it a very efficient process. On the contribution of the group’s projects in Singapore to its earnings, Teh says it is not significant at the moment but should pick-up due to the Gilstead Two development. The group also has several projects in the pipeline in Malaysia to be launched soon. This includes 20Trees West, a low density bungalow development in Melawati which comprises 48 units of three-storey bungalows with swimming pools. The size of the homes range from 6,200 sq ft upward. Teh says SDB also has a new condominium project located in a quiet enclave along Jalan Ampang, close to the British High Commission. The development is called Dedaun and it comprises 38 units of spacious homes in a 10-storey building. 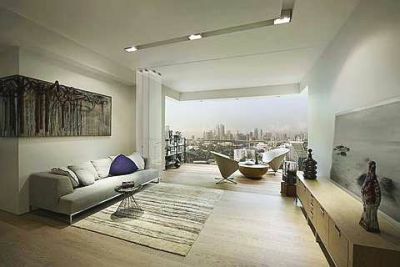 “These homes measure about 3,200 sq ft, and have been designed with the sublime feel of homes in the 1970s,” says Teh. On the outlook of Malaysia’s property market this year, Teh says it has definitely improved. “Our launch of the second phase of Five Stones (a high-end condominium in Petaling Jaya) was very well received. The GDV for Five Stones is RM420mil and we have achieved 97% of the GDV. So things are definitely moving in the right direction,” she says. On the company’s market focus, Teh says all its developments have been high-end projects. “This ties in with our development concepts which focus on smaller scale, more private developments. For the moment, we will continue to focus on this type of products,” she says. “We would like to focus on developing here (Malaysia) and in Singapore for now. However, we will look into other countries if the opportunity arises and when the time is right,” says Teh. SDB began way back in 1962 when it was incorporated as Selangor Dredging Ltd. In 1964, the company changed its name to Selangor Dredging Bhd upon listing on the main board of the Kuala Lumpur Stock Exchange. For over two decades, the company’s sole business was tin mining, operating two dredges in Dengkil. In the early 1980s, SDB began to put in motion a plan for diversification. This led to the company’s involvement in various activities including hardware manufacturing and retail manufacturing of tyre rims for national car Proton and Perodua. In 1985, Wisma Selangor Dredging, the company’s first property was completed and in 1997, SDB’s hotel property was completed. After a period of consolidation, which was completed in 2004, SDB is now fully a property company, principally involved in hotel, property management and leasing and property development. Singapore's CapitaMalls Asia Ltd may raise up to RM995 million from the listing of its Malaysian assets in a real estate investment trust on the Main Market of Bursa Malaysia. The listing will help the company accelerate growth of its shopping mall business in Malaysia, as the property trust will provide direct access to both the domestic and international capital markets. CapitaMalls Asia told the Singapore Exchange (SGX) yesterday that it had received the approval from Malaysia's Securities Commission (SC) to list CapitaMalls Malaysia Trust (CMMT), which will hold the company's three Malaysian shopping malls. 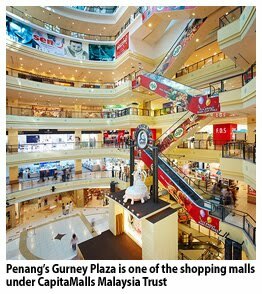 They are Penang's Gurney Plaza, Sungei Wang Plaza in Kuala Lumpur and The Mines in Seri Kembangan, Selangor - with a total property value of RM2.13 billion and total net lettable area of 1.88 million sq ft. However, the decision on when to list the REIT will also depend on several factors, including prevailing market conditions. The listing is for 1.35 billion CMMT units, of which 786.52 million units, or 58.26 per cent, will be offered to Malaysian and foreign institutional and other investors as well as Malaysian retail investors. CapitaMalls Asia will retain an interest of 33.00 per cent to 41.74 per cent in CMMT after the offer, dependent on whether an over-allotment option is exercised. Two cornerstone investors, the Employees Provident Fund and Great Eastern Life Assurance (Malaysia) Bhd, have committed to subscribe 90 million units, or 11.4 per cent, of the total units offered. They will pay RM1.10 per unit or the institutional price, whichever is lower. The estimated distribution yields for 2010 and 2011 are 6.5 per cent and 6.8 per cent respectively. While no definitive price has been fixed, the company could raise some RM995 million based on a price of RM1.10 per unit if CapitaMalls Asia chooses to retain an interest of only 33 per cent. The trustee for CMMT is AmTrustee Bhd. Malaysia is a key growth market for CapitaMalls Asia and the third largest contributor to the company's earnings before interest and tax for the financial year ended December 31 2009, contributing S$52.4 million. The company said that CMMT will be Malaysia's largest listed "pure-play" shopping mall REIT by market capitalisation and property value. The REIT will be CapitaMalls Asia's designated listed vehicle to hold its stabilised Malaysian retail assets as the company seeks to capitalise on acquisition opportunities in Malaysia. Business Times reported recently that CapitaMalls Asia plans to invest some RM3.5 billion in Malaysia over the next two to three years to buy existing malls and build new ones. "The planned listing of CMMT is part of the company's strategy to list in the home markets of our assets, and to recycle capital for reinvestment. It will enable us to accelerate our growth in Malaysia, and develop fee-based income for the company," said CapitaMalls Asia chief executive officer Lim Beng Chee in the statement yesterday. This is the second REIT that CapitaLand Group is sponsoring in Malaysia, the first being Quill Capita Trust which was listed in 2007. HANOI: Southeast Asia's largest property developer, Singapore-based CapitaLand, says it plans to increase its assets in Vietnam tenfold and is building thousands of new homes. "Vietnam has been earmarked as the group's most important overseas market in Asia, after China," the company said in a statement. The firm will invest S$299 million (S$1 = RM2.38), and is looking to hold ten percent of its assets in the country within the next three to five years, said Chen Lian Pang, chief executive officer of CapitaLand Vietnam Holdings. "The real estate market is supported by the country's strong economic growth, rapid urbanisation, and a young and growing population," said CapitaLand, which is building more than 4,000 residential units in Vietnam. It says it is the largest owner-operator of international serviced residences in the country, with five under the Somerset brand and three others being developed under contracts. Vietnam has a population of almost 90 million people. The economy grew by 5.32 per cent last year despite the global economic and financial crisis. Prime Minister Nguyen Tan Dung told global business leaders on Sunday that the economy is expected to expand 6.5 to 7 per cent this year, against a government target of 6.5 per cent. Singaporean firms are among the major investors in Vietnam.